SACRIFICES, book three in Mercedes Lackey and Rosemary Edghill’s novels of the Shadow Grail, starts off exactly where book two left off: There are alumni of Oakhurst Academy actively “helping” the students, but students Spirit White and her four friends Loch, Addie, Muirin and Burke think something is desperately wrong. (Please see the reviews for books one and two here.) Somehow, the legend of King Arthur is involved, as the mysterious QUERCUS has hinted via computer message, and Spirit in particular is starting to wonder if many of these alumni are truly evil rather than merely obnoxious. Making things even tougher, at least some of the other students at Oakhurst have been taken in by the alumni, all of whom work for a large computer company called Breakthrough Systems. (Allusions to the terrible world economy, which apparently even magicians can be affected by, firmly anchor this story to our present-day reality.) But as Spirit finds out early on in SACRIFICES, these alumni are evil . . . worse than that, they’re actually Shadow Knights, reincarnated from the days of King Arthur (which apparently weren’t legend after all, but history misrecorded as myth). And they are bound on the world’s destruction . . . .
Everyone’s paranoid in SACRIFICES to a degree that may shock readers if they haven’t re-read LEGACIES and CONSPIRACIES recently (books one and two of this series, respectively). But there’s a reason for that, which is enumerated very early on (right after the deft “what has gone before” summation in the first few pages to get everyone back up to speed): Students are getting “challenged” by the evil alumni. If they come back at all, they wear the pin of Breakthrough Systems — are, in effect, Shadow Knights in training — while those who decline, presumably, are killed outright. And long-time teachers at the Academy are not exempt from such things, either, especially if they try to help the remaining students outwait or outlast the Shadow Knights. (This is one reason the book’s title Sacrifices has so much meaning.) The fact that some teachers put their lives in danger — and that some may end up laying their lives down — helps to up the danger and complexity of the problem Spirit and her friends must face. Because, you see, the pressure is real. The Shadow Knights wish to annihilate the world, and have the magic to do so. And their only concern is to pick what they believe is the “right moment” — a moment before any of the magical forces of good, which must be somewhere even if Spirit and her friends can’t seem to find them (save QUERCUS, of course, and a few of the teachers at the Academy), catch on to their evil — to blow the world up out of spite. Mercedes Lackey and James Mallory’s newest novel is CROWN OF VENGEANCE, book one of a new trilogy about the great Elven Queen Vieliessar Farcarinon. Previous readers of Lackey and Mallory’s work will recognize Vieliessar from a short snippet in a previous novel, WHEN DARKNESS FALLS (book three of the “Obsidian Mountain” trilogy). She was described as the best queen the Elves ever had. She was also the best mage, the wisest ruler, skilled with both sword and magery alike. And of course the legends about her mostly speak of her benevolence, as she’s the one who drove the nasty, vicious Endarkened out of Jer-a-Kaliel. If you’ve read the other six books Lackey and Mallory have written about this world, you already know that Vieliessar’s story isn’t going to go exactly the way history has remembered it. Because of this, you can safely assume that Vieliessar is both more and less than what history gives her credit for. So yes, she will turn out to be a triumphant Queen. And a brilliant military tactician. And a great mage, oh yes. But she’s also a flawed person, someone the reader can empathize with. Because her power sets her apart. And it’s hard for her to find anyone who can relate to her, due to her own amazingly strong abilities. Having a sympathetic heroine is absolutely essential in a book where most of the character names are at least four syllables in length. And when a character has hundreds of years to become what she needs to be, for that matter — because Vieliessar isn’t human. She’s an Elf. And at this time in Jer-a-Kaliel’s history, because we’re so far back in the past, humans aren’t even in the picture because they haven’t yet evolved enough to matter. We pick up Vieliessar’s story literally at birth. Her noble mother, Nataranweiya, has fled to the Sanctuary of the Star — clerics and mages, the equivalent of a nunnery or monastery — as her husband has been slain, along with nearly all of her retainers. (Those few she had left were the reason she was able to reach the Sanctuary at all.) Nataranweiya gets there, gives birth, and promptly dies . . . but because Vieliessar’s birth was seen centuries ago by an ancient and possibly mad King, and because Vieliessar is, after all, in a holy Sanctuary, the enemies that brought down the House of Farcarinon are not able to kill Vieliessar outright. We pick up the story again when Vieliessar is twelve. Renamed “Varuthir,” all she wants to do is to become an Elven knight. She knows nothing of being the last of Farcarinon; she knows nothing of her birth, her mother, her status as “Child of the Prophecy” or anything else. So when she’s shipped off to the Sanctuary of the Star to become a perpetual servant, she is outraged. That one of the nobles cruelly tells Vieliessar exactly who she’s supposed to be (minus the Child of the Prophecy part, as the Sanctuary didn’t let on about any of that) before she leaves just adds salt to the wound. So, Vieliessar goes to the Sanctuary, and becomes a servant. She’s there for perhaps as many as ten years, learning that servants are people like any other — that the “Landbonds,” who’ve been held as serfs, tied to the land, are perhaps more noble than anyone who’s inherited a title — and that magic has its limits. Then, one day, she calls fire. A wise servant tells Vieliessar to hide her new abilities, as if she’s chosen to become a Lightsister (mage and cleric, both), she’ll lose her protected status. (Only if she stays in the Sanctuary or on its grounds is she safe. And perhaps not on the grounds, depending on how the other noble houses feel about it.) But of course Vieliessar isn’t able to do that. If she had been, it would’ve been a much shorter, and far less interesting, book. But I digress. The remainder of the novel deals with how Vieliessar first becomes a mage, then an Elven knight, and finally reclaims her birthright as a noble. In so doing, she realizes she must unite the Hundred Houses behind her banner, as she firmly believes that evil is approaching, just as that mad King said centuries ago. But her quest is not an easy one. Before she’s done, she may alienate every friend she has, all to keep at least some semblance of Elven society alive. And because she knows this — and knows how rare it is to find a true meeting of the minds, besides — her fate and fame become that much more compelling. There’s some really good characterization here. The problems of the Landbonds and servants are well-drawn. The nobles — Higher and Lesser — are also well-drawn, though their petty politicking grows tiring even to those Highborns willing to partake in such. And despite her immense powers in a wide variety of spheres, Vieliessar is a likable, winning heroine that most readers will be willing to cheer for — even as they wish the Endarkened would just go away and leave her alone already. Because this is book one of a new trilogy, you may safely assume that the scenes with the Endarkened are more like an appetizer than an actual main course. This is fine, as far as it goes, especially if you’ve read the previous six books. Bottom line? 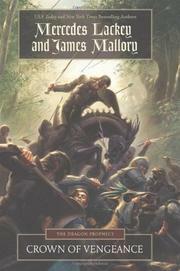 This is a fine epic fantasy, a quest story with heart, and a compelling read from beginning to end. 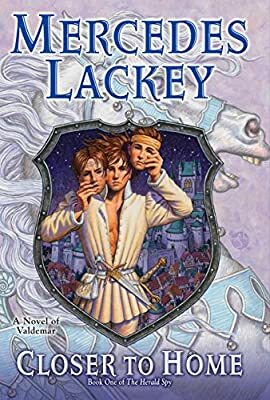 If you love epic fantasy, loved any of Lackey and Mallory’s previous six books in this world, or have enjoyed any of the two authors’ solo efforts, you will enjoy this book. And if you love all of the above, plus appreciate seeing that legends aren’t always what they’re cracked up to be (they might be more, might be less, but are assuredly different), you will adore CROWN OF VENGEANCE. 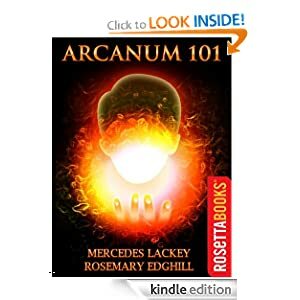 Tonight’s reviews are for the first two books in Mercedes Lackey and Rosemary Edghill’s new “Shadow Grail” series, those being Legacies and Conspiracies. These are urban fantasies and feature as their main character Spirit White, an ordinary teen from Indiana. Legacies starts off with a terrible accident, as Spirit’s whole family has been killed in a car accident. That same accident landed Spirit in the hospital; she endures extensive rehabilitation in order to be able to walk around. When she starts feeling a little better, at least physically, she finds that her parents had apparently left a will saying that Spirit should be sent to Oakhurst Academy in the event of their deaths — and as she’s never heard of Oakhurst Academy before, she doesn’t really like this. Spirit’s parents weren’t wealthy, and she wonders, once she sees the lavish school (which is in the middle of Montana, far from the maddening crowd), how she ended up there of all places. It turns out that Spirit is a Legacy — that Spirit’s parents had attended Oakhurst themselves, and never discussed it with her — and apparently there are many other Legacies out there in similar situations to Spirit’s own. Despite these other folks in similar situations, Spirit immediately starts to flounder because Oakhurst isn’t just a preparatory school with an outstanding record; oh, no. It’s a magical school, and everyone who attends must have magic — so even though Spirit hasn’t any more magic than a flea as far as she knows, she’s quickly ensconced in the school. And she becomes friends with four others, all of whom have evinced magical talents Spirit herself doesn’t have: Muirin Shae (a chocoholic and caffeine addict; she’s wealthy and her stepmother doesn’t like her), Adelaide (“Addie”) Lake (a sweet girl who rarely raises her voice), Lachlann (“Loch”) Spears (he’s wealthy, he’s gay, and he quickly becomes Spirit’s BFF), and Burke Hallows (a jock, and Spirit’s eventual love interest). These disparate teens all know that something about Oakhurst Academy has set them off, and they aren’t buying what the director of the Academy, Doctor Ambrosius, is selling, which is the main reason they take to Spirit right away. But of course there are other reasons, the primary one being that Spirit is grieving. She misses her parents. She misses her sister. She’s been thrown into demanding educational coursework, and even though Spirit herself doesn’t have a clue what her magical talent is (if she even has one), she knows magic is real by the talents her friends have — and accepts it rather placidly at first, as Spirit obviously has only so much energy and she’s using it all just to live. But then, terrible things start happening; some students go missing. And in doing some research, Spirit and her friends find out this has been going on for many years — the Wild Hunt seems to be involved (this, by the way, is the only “typical” arcane referent here, and the only sidewise reference to the Court of King Arthur), and yet the teachers aren’t doing anything about it. So Spirit and her friends decide to mix in . . . while I’ll stop my review for Legacies right there, know that the action-adventure was crisp and believable, and the “teen speak” makes sense. All the conventional trappings are there: this is present-day, so we have IPods, computers, instant messaging (IMs), e-books, you name it. And we have a believable, workable system of magic, plus some authority figures that don’t ring true and some real bad juju going on. In other words, as book one was a success, next is book two, CONSPIRACIES. Here, Spirit White and her friends continue to fight against the Wild Hunt as more kids — and even some teachers — have been taken. No one is helping Spirit and her friends out openly, though there may be a teacher or two who is willing to help covertly as Spirit gets help from an unlikely and unusual source, one that is not named. And now, Doctor Ambrosius has asked the alumni to come back to Oakhurst Academy in order to help the students “fight the evil,” yet these alumni don’t necessarily seem all that much on the side of the “good and the right,” either . . . so what’s to do? Once again, Spirit and her friends are able to keep themselves alive, and they learn a few more things. It turns out that at least some of them are Knights of the Grail — that is, they’ve been reincarnated, even though neither Spirit nor any of her friends know which person they might’ve been in the past. And there also are Shadow Knights out there — those who originally backed Mordred (Arthur’s son) against him — and this conflict has escalated because of a number of factors (all of which I’d have to blow the plot out of the water to explain, so apologies for stopping with that). Muirin is courted by one of the alumni assiduously, to the point that it sets Spirit’s “antennae” off because Muirin is only sixteen, at most, and this guy courting Muirin has to be at least twenty-one. Spirit and Muirin become closer due to this and Muirin starts teaching Spirit about fashion (one of Muirin’s passions). Loch is nearly outed by one of the alumni, which really worries Spirit as she’s not sure what to do about this. (Loch doesn’t seem overly concerned, except they are in Montana and Montana isn’t exactly known to be gay-friendly.) Loch had already determined that most of the alumni called in by Doctor Ambrosius were up to no good; that someone would be willing to “out” him for no reason just confirms his belief that these alumni must be fought. 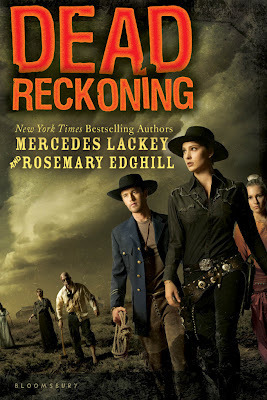 Addie realizes she has a Destiny — soon after, the other three of Spirit’s friends also realize this (though Spirit, herself, doesn’t seem to have one) — and that means either something very good is in her future, or very bad. In either sense, though, Addie won’t be able to avoid it, as a Destiny is something that absolutely must come to be even if you’re not exactly sure what it is. (This seems akin to clairvoyance without actually needing a clairvoyant around to muddy up the works.) Addie helps hold the disparate group together, as she definitely seems the most maternal; she’s gifted at organization, planning, and compassion. So that’s where the Shadow Grail series stands thus far; we have five people who know they must fight against magical evil. They know reincarnation has something to do with it. They know that the Morte d’Arthur has more than a little to do with it, no matter how odd it seems. And yet, they’re teens, with typical teen problems and angst, with the additive problems of these chaotic alumni and the fact that two of the five are seriously grieving at the moment. I definitely recommend this series; it is a must-buy, mostly because it gets the issues right that teens have to deal with, and partly because it gets the grief issues absolutely right. I’m looking forward to reading books three and four, and will be very interested to find out what Spirit’s magical talent is (as it’s still not been revealed), whether she and Burke will stay together, whether Loch will be “outed,” and whether the alumni truly are as evil as they seem. B-plus, Legacies, only because of a slow start. (I honestly don’t know of a better way to get all the information in there than what Lackey and Edghill did, mind you; they didn’t “info-dump,” for which I thank them.) Nice action, intrigue, and hints of menace, along with getting the major “teen stuff” right.